Distance, on a larger scale, is something that – for most of us – is very difficult to represent accurately in our minds, and that is merely a biological drawback. The routes you take often – such as traveling to work or school – are built into your mind so that you have a strong understanding of how far it is, and how long it will take you to traverse. Our planet has a radius of about 6,400km, but we never cover these large distances across the globe, making it quite difficult to discern how large Earth is in comparison to the minute scale of human things. But we now know that we can zoom out of our quaint, picturesque blue dot and see that the Earth is situated in a solar system about 2 light-years across (remember it takes light traveling at 300 million m/sec just 8 minutes to reach Earth, so consider traveling this distance for 2 solid years), containing planets hundreds of times its size, all revolving around a star that could swallow all of them up several times over. Zooming out, we see our local stellar neighbourhood; a collection of star systems around 30 light years across. If we expand our field of view further; we have the famous Milky Way galaxy. It comes in at a staggering one hundred thousand light years across (meaning, it takes light 100,000 years to travel from one side of the galaxy to the other). We can picture what this looks like because it is easy for us to generate the cool graphics that I’m sure you are familiar with, but actually coming to terms with this kind of distance is an almost incomprehensible task for the human mind. 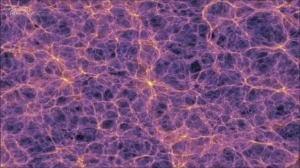 (I think ‘Scale of the Universe’ is the best interactive programme on the internet to help with understanding distance. Check it out here). 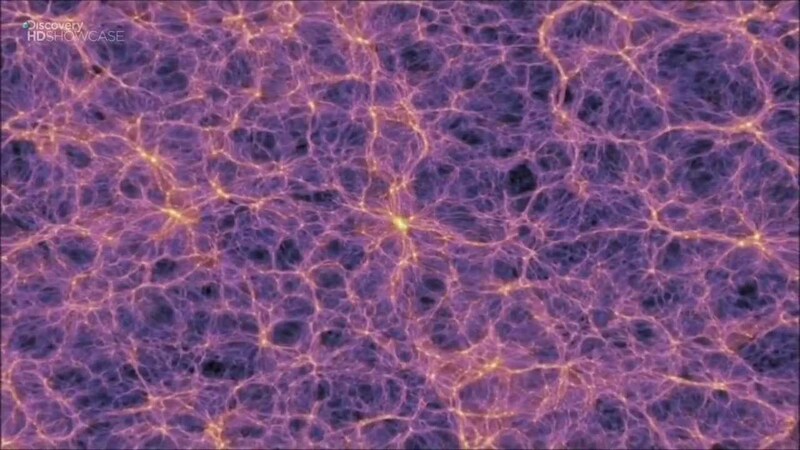 Today though I want to go further than this, and I want you to consider the next level up for stellar structures, and these structures are formed out of galaxy clusters. We belong to the ‘Local Group’ – a collection of neighboring galaxies – such as M31 (or Andromeda) – that measure in at about 10 million light-years across. But what we are really interested in takes us one step further than this. The enormous cosmic structure I want to discuss is 110 million light years across – containing about 100 billion times the volume of our galaxy – and engulfing 100 other galaxy clusters, like the Sculptor Group, the Maffei Group, and the M81 cluster (a total of 47,000 galaxies). Its name is the Virgo Supercluster. 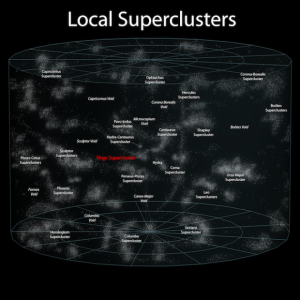 Superclusters exist in their millions throughout the entire universe, which in turn, form supercluster complexes. These complexes form large-scale filaments and sheets that span about a billion light years across (each). Together, they comprise the largest structures in the universe. The latest information from deep space telescopes suggest these fundamental structures exist in a honeycomb or bubble-like formation, and the observations may give us insight into the early conditions of the Universe. The Virgo Cluster – containing 2000 galaxies – sits around 55 million to 65 million light years away, and is the central pivot of our supercluster (hence the name the ‘Virgo Supercluster’). Similar to many other superclusters, ours is built into a rough disk shape; the majority of galaxies are in this plane, but only about a third of them are positioned around it in a halo-like formation. Studies have put the Local Group near one edge of the Virgo Supercluster, and we appear to be revolving around the centre of the plane at about 400,000m/s. The 2MASS Redshift Survey (2MRS) aims to provide us with a better understanding of the distribution of galaxies in the supercluster, as well as other properties, including size, shape and mass (suspected to be about 10,000,000,000,000,000 solar masses) of the formation. 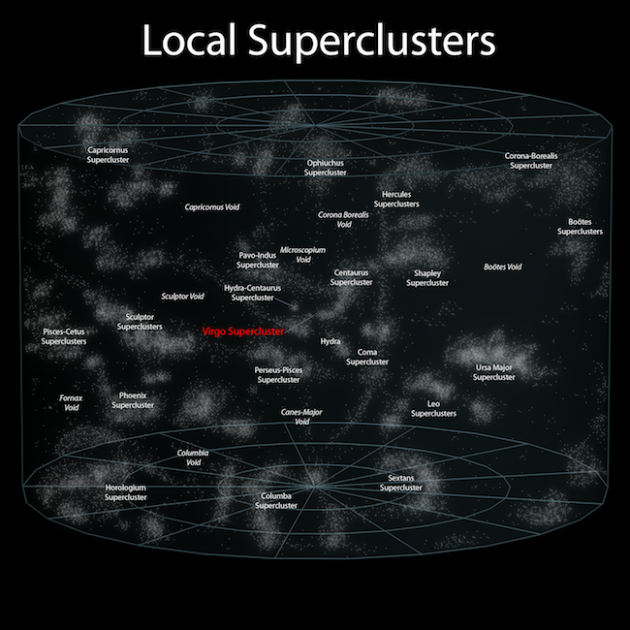 What I think is the most amazing fact about the supercluster, is that in 100 billion years from now, the gravitational attraction between galaxies and clusters will have pulled it all into a single, enormous, writhing mass of stars. At this time, other superclusters will also be converging together, separated by billions of light years due to the expansion of the Universe. However, something interesting that you may be familiar with is that astronomers have actually noticed an unusual movement of galaxy clusters within the supercluster. Many are moving in the direction of the Norma Cluster, but it is very difficult to see why because of the large amount of material in the Milky Way’s plane. For now this has been dubbed the ‘Great Attractor’ due to its unexplained tug. It may, in fact, be related to dark flow: a mysterious force tugging on galaxy clusters from beyond the scope of the observable universe. Further research into these structures will surely bring many more of their secrets to light, and unlocking those very mysteries may answer some of the deepest questions about our Universe. How did it begin? And where is it going? Graphene Gel: The Future of Energy Storage?